This article is about LEGO figure. For the theme, see Minifigures. Minifigures are small (size is specifically 4 cm, 1.5 inches, or four bricks tall), plastic-made figures. They connect to normal LEGO Bricks, and usually consist of ten parts. The minifigure was designed by LEGO model builder Jens Nygaard Knudsen, along with other early minifigure designs. A basic minifigure is composed of several separate essential LEGO pieces: head, torso, arms, hands, hips, and legs. Minifigures typically come packaged as three separate parts in LEGO sets: head, torso/arms/hands, and hips/legs. Each basic plain minifigure has the same height as four normal stacked bricks, but when using head accessories, it can make the minifigure slightly taller. The legs can rotate independently beyond 90 degrees forwards and approaching 45 degrees backwards, making a total rotation of 135 degrees. They also attach to normal LEGO bricks in either a sitting or standing position. There are long legs like those of the Toy Story character Woody, which can still rotate, and short ones like Yoda's or Dobby's, which cannot rotate. These short legs are commonly used for children in the City theme, as well as many other themes. There are also tails that can attach the same way as minifigure legs, they are only used on Skales, Fangtom, Acidicus, Skalidor, Medusa, and Pythor. LEGO has made a peg that can fit in the leg sockets. A few LEGO arms, such as some of the Minifigures (Theme) have printings on them. The hands of a minifigure are shaped similarly to a "U" or a "C", which allows them to hold many LEGO accessories, as well as plates and tiles (by their sides), or on the top of the minifigure's hand. There are hundreds of different accessories, including axes, magic wands, cups, guns, swords, food etc. The tops of the hands are also roughly the same size as the studs on LEGO bricks, allowing various LEGO pieces to be placed on top of them. LEGO has made extra pieces that fit in the hand socket, like pirate hooks or boxing gloves. 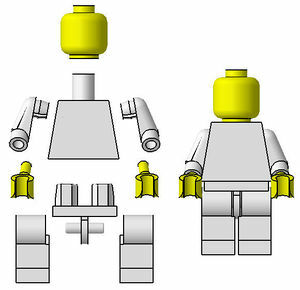 Minifigure heads are cylindrical, and attach to long narrow cylinder at the top of the torso, which allows the head to rotate. This also allows special items to fit over the torso, such as air tanks, rucksacks, capes or breastplates. The standard heads (LEGO has made other forms of heads for weird aliens and such) also have a stud on top (which is the same size as studs on LEGO bricks), which things can be attached to. Head accessories are varied, including hair, helmets, hats and hoods. These variations allow minifigures to be highly customizable. The first minifigures from 1974. The original LEGO figures were DUPLO Figures, but the first System figures were known as LEGOLAND Minifigures. These are similar in height to minifigures, but have one-piece non-movable legs and a one-piece torso. They were blocky and their arms were depicted as being in their pockets. The figure's heads were the same as those of minifigures, but they were blank. They also came with hats or hairpieces. In the LEGO Book, they were modified by the designers of the minifigures continuously, going through various stages with movable arms, circular hands, and textured faces. Eventually the designers settled upon what is considered a minifigure today. The first minifigure with movable arms and legs was a police man released in the year of 1978, with seven different figures in Castle, Space and Town themes. Many Town minifigure torsos had a sticker instead of a printed pattern on one. The Castle minifigures have plain torsos, instead having a body part with a sticker/symbol on it. The Classic Space minifigures were the first to be printed, but their printing rubbed off easily. Until 1989, minifigures' heads only had a simple facial expression of two black dots for eyes, and a black curved smile. In that year, minifigures in the Pirates theme were produced with different facial expressions. The Pirates minifigures also included hooks for hands, and wooden legs, the first departure from the traditional hands and legs. In 1997 the release of the Western line of sets saw the introduction of the first minifigures with racial characteristics, with the Indian Minifigures. In 2003, the first Minifigures with natural skin-tones – as opposed to the yellow previously used – were released as part of Basketball; these minifigures also represented specific people. The following year, the use of natural skin tones was expanded to licensed products, such as Indiana Jones, Harry Potter and Star Wars minifigures. As of 2003, LEGO had produced four billion minifigures. There are at least 3655 different minifigures produced between 1975 and 2010 and the number of new minfigures per year is increasing rapidly. 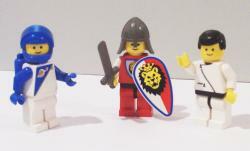 In 2010 more than 300 new minifigures were introduced. 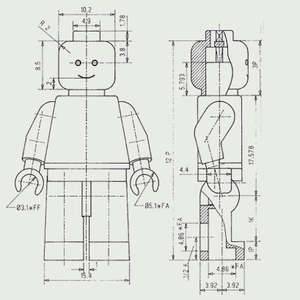 Technical drawing of a Minifigure. While almost all minifigure torsos, arms and legs are the same size and shape, some sets and themes have included figures that differ from this standard. The Alien Pirate and Alien Commander minifigures have a normal trans-green head with no expression, but have a neck piece that resembles the face of the alien, and a hat piece that resembles the brain. The minifigure's head then resembles a specially moulded head. Some minifigures for women, particularly in Castle and Pirate sets, have used large 2x2x2 sloped bricks instead of legs to resemble dresses or skirts (slightly longer than legs). Skeletons, in Pirate and Castle sets, have the standard minifigure head, but have specialized skeletal arms, legs and torso (which are still detachable from each other)-in addition, a new version of skeleton torso was produced with more articulate arms. Shorter legs, without joints at the hip, have been used for children, Yoda and Ewoks in Star Wars sets, Goblins and House Elves, such as Dobby in the Harry Potter sets, Dwarfs, in Castle, SpongeBob and Mr. Krabs in the SpongeBob SquarePants sets, Short Round in the Indiana Jones sets, Stinky Pete and the Aliens in the Toy Story sets, and more. Pirate minifigures have had peg legs (one leg and one peg leg) and Hooks for hands, later used in other themes such as Adventurers, Alien Conquest, Alpha Team, and Legends of Chima. The minifigures Squid Warrior from Atlantis and the Alien Commander have legs that resemble tentacles. Hagrid, from Harry Potter, uses a larger minifigure, with only the head being separable. Lately, some minifigures, such as Woody have also had heads that differ from the traditional cylindrical shape. Traditional accessories, such as hats and helmets, cannot be placed on these different heads. Examples include Stinky Pete, Yoda, Ewoks, Dobby and Goblins as mentioned above. Some minifigures, such as Chewbacca, SpongeBob and Thi-Sen have head pieces that fit like ordinary heads, but end up covering more. In Orient Expedition, a subtheme of Adventurers, there are large figures (Yeti, Tygurah, Jun-Chi, all of which were made of a large pair of legs and a torso). There has also been a taller type of minifigure leg, released in Toy Story, to allow for a height different between Woody and Buzz while allowing Buzz to remain taller than some others. Woody, Jessie and Zurg also had longer arms so they're more to scale with the longer legs. 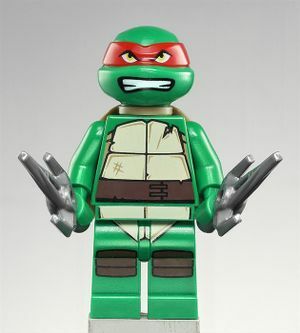 Raphael, a minifigure with a custom head that cannot use hair or a hat. Child-friendly versions of minifigures, which are much more difficult to take apart, have also been designed. Plus, some of the newer figures have special features that can light up (such as lightsabers and flashlights). By pressing down on their heads, their flashlight part (which is also a lightsaber handle and is one piece with the hand and arm) lights up. While this adds a new feature, these minifigures cannot come apart into as many pieces, which could discourage those who wish to customize them. The top of their heads can come off, because inside of that is a battery. However, it is not especially easy to do so and can damage them. Their heads can also come off, but it is not suggested because the heads connect to the body where the electricity travels to the arm. Minifigures built from special pieces were first introduced in Star Wars. Martians are builds for five pieces: two double arms, mechanical torso, a combined leg piece and a head. This formula is repeated for many Star Wars droids. Battle droids follow the same pattern, while Super Battle Droids have the head fixed to the torso, General Grievous has space for four arms and IG-88 has a head constructed from LEGO elements. Other droids, such as Droidekas, Spider Droids and Pit Droids, are constructed entirely from ordinary LEGO elements many of which were originally made for the droid minifigures, but are none the less often considered minifigures. R2-D2, and other Astromech Droids, are constructed from specialized elements; with a separate top, body and two legs. The Exo-Force robots have a design similar to the battle droids, but have separate legs and movable hands, and the head fixed on a small torso. The minifigures C-3PO, Protocol Droid and TC-14 have a special molded head for characters in the Star Wars franchise. There are also Skeletons of a newer kind, who have a similar design to the battle droids. They still have a skeleton torso and legs, but their arms now can move articulately. 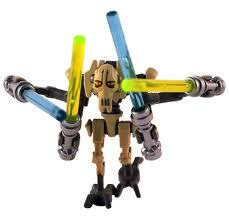 In addition, in 2007 new Battle Droid arms were released, allowing droids and skeletons to hold their weapons straight up instead of sideways only. There have also been very rare minifigures released, such as a 14K gold C-3PO which only 5 were made, a bronze Boba Fett and a silver TC-14. LEGO has made several "systems", where there are particular sets that have a central theme or story. Some examples include the Orient Expedition, Star Wars, Alpha Team, Knights' Kingdom and Knights' Kingdom II. Some of the minifigures from these sets are from popular films or series such as Star Wars, Batman, Indiana Jones, Harry Potter, The Lord of the Rings, and Prince of Persia. Also, LEGO has some spinoffs or spoofs of popular series, such as Adventurers. Alpha Team was a theme where minifigures in the team fight against Ogel. In 2004 the LEGO Group established sets that included minifigures based on real actors would have their skin tone would change accordingly. Hence the flesh toned minifigures seen in recent Star Wars sets. The Exo-Force storyline features minifigures with colorful anime hair and eyes. The hair was also rubbery. LEGO's older themes also had some storyline aspects, although they were rarer and became much more common later on, when LEGO books and magazines were more common (mid-to-late 1990s). In some lines of products, LEGO has used figures other than the standard minifigures. TECHNIC has used larger TECHNIC Figures from 1986 to 1999. These figures are more realistic, although still angular, and have more degrees of motion, such as at the knees and elbows. However, they cannot be easily disassembled; even hair is non-removable. Some included helmets. The Fabuland line of the 1980s consisted of larger anthropomorphic animal characters, which also could not be easily disassembled. All parts of Basic figures inspired by DUPLO Figure and Fabuland Figure were also firmly fixed together. The two variants of this figure were used in 3+ building sets between 1981 and 1991. Belville and Scala, LEGO lines aimed at girls, also have larger figures. They are similar to TECHNIC figures in range of motion, but have less angular legs, arms and torsos. Scala figures more closely resemble Dolls, in that clothes are separate from the figures and the hair is composed of strands and not moulded plastic. More recently, LEGO introduced BIONICLE figures, such as Toa, which are larger than normal minifigures. They are also composed of separate pieces, unlike other large LEGO figures. In 2005, LEGO released BIONICLE playsets for the first time, with minifigures of characters that previously only had large figures (Toa and Visorak/Piraka). While these minifigures did not have movable parts, in 2006, LEGO released Toa Inika playsets containing minifigures with movable parts, similar to the Robots from Exo-Force. They followed this with the release of playsets containing the Toa Mahri in 2006, which were largely similar except for the addition of a new specially-moulded arm element. Another type of LEGO figure is found in the Jack Stone sets, called 4+ Figures. They have carved faces, but are bigger, and do not have interchangeable parts. Similar large figures were also found in other themes, such as the 4+ Spider-Man and Creator sets. Another different minifigure is the Skeleton. They are made up of several different pieces, only one of them (the head) used in regular minifigures. In the LEGO board games, LEGO has made Microfigures that are easier to move around a gameboard than average minifigures. They are smaller, made of one piece and do not have separate arms or legs as said above. They also do not feature any poseable components. There have been several micro figures such as Hermione Granger and Robin based off minifigures. In 2012, LEGO made the mini-doll figure, which is 3 millimetres taller than a regular minifigure (with no hairpiece). So far, over a hundred different mini-doll figures have been produced. Initially, they were exclusive to the Friends line, but in 2014, they were adapted to the Disney Princess theme. In 2015, Elves also made use of the mini-doll figure. Unusual NBA player minifigure with longer arms attached to the hands, also with spring loaded hips. This page was last edited on 14 May 2017, at 22:56.